With Memorial Day approaching, I bet you’ve got some weekends away with friends planned. 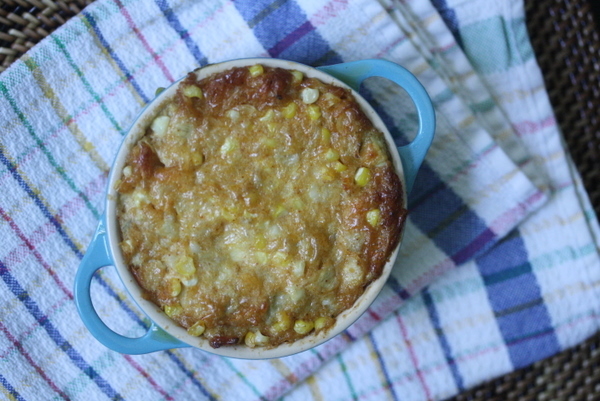 Pack swimsuits, booze, maybe a cute dress – and this recipe for Southwestern Artichoke Dip with Sweet Corn. There’s a reason dips are great for groups: they’re fun, they’re filling, and they’re easy to make in massive proportions. As the countdown begins to summer we highly recommend mastering a few dips and putting them into your weekend-away repertoire. Mexican flavors seem to score extra points–cheese solidifies your status as Weekend Away Chef of the Summer. This one’s got Southwestern flavors (cayenne and corn), it’s gooey and rich (lots of Parmesan cheese), and the dish will be licked clean by the end of the night. You shouldn’t have trouble finding most of the ingredients at any old convenience store, but if you don’t see artichokes, you can always sub in spinach. And, feel free to double, even triple the recipe! To get the recipe, click here!